Hairsite, could U get Replicel CEO Buckley to do a short interview or come discuss a few things with us? Some of us would like to ask CEO Buckley of Replicel some questions. Could you arrange a short interview with him or get him to come here for a short time to clarify a few things? It would be very helpful. Can you post your questions here? RepliCel will be attending Dr. Mwamba’s Hair Conference in a couple weeks from now. I can ask if Dr. Mwamba’s team can pass your questions to RepliCel at the conference. At the 6-month mark 30% of the test subjects lost hair. I would like to know what became of these 6-month non-responders. How do they fit into the 24-month data? Did they lose more hair? Did they revert back to baseline after losing hair? Did they revert back to baseline and then grow some new hair? Are they factored into the 24-month data? What become of their situation? Assuming that Replicel’s treatment will arrest hair loss, I would like to know if Replicel’s management has considered that if patients could arrest their hair loss then that would open up hair transplants to millions and millions more patients? For example, if a patient is at NW3 but if he’s going to reach NW6 in time there isn’t much point for him to get a hair transplant. Some patient’s even thin in their donor area. I see people with thin wispy hairs in their donor area every day. But if he can freeze his hair loss at the NW3 stage then he could transplant his donor area into his thinning areas, which would likely result in a full head of hair, and then he could get Replicel treatments every few years to preserve that full head of hair. Propecia and Rogaine can freeze hair loss for some patients but they have to be used daily, they carry a risk of sexual/gynecomastia side effects, and they don’t freeze hair loss for all patients. 3… If Follica or another treatment gives a patient 20% new intermediate hairs Replicel could perhaps turn those intermediate hairs into terminal hairs, if Replicel can increase the diameter of existing hairs. Did Replicel increase the diameter of the hair shafts where the treatment was injected? My point is that even if all Replicel does is arrest hair loss and turn intermediate hairs into terminal hairs that could be huge in conjunction with hair transplantation or other treatments. There are a number of treatments in the pipeline that increase the number of hairs, such as Follica, SM0455. If Replicel can arrest hair loss and increase the diameter of intermediate hairs then Replicel could combine with hair transplants or other treatments to let millions and millions more patients get a reasonably full head of hair. Terminal hairs = thick, long, healthy hairs. vellus hairs = tiny short peach fuzz like hairs that you can barely see. Intermediate hairs are hairs that have started getting thinner and shorter but have not shrunk down to peach fuzz type vellus hairs yet. @jarjarbinx I think you are wasting your time on Replicel, the trial numbers speak for themselves, I am not impressed. Histogen looks more promising. I understand that Replicel is not going to grow a lot of hair but what if it arrests hair loss? That would be a big deal. It would substantially increase the number of people who could get hair transplants. Right now the only way to arrest hair loss is minox + finasteride but it doesn’t work on everyone, it has sexual side effects, and it’s inconvenient. If you could get one treatment every 2 - 3 years and your hair loss would freeze where it is that would be a big improvement over our present ability to freeze hair loss. This could be a big deal. Let’s say Follica gives you 20% new intermediate hairs, maybe Replicel could turn them into terminal hairs. It appears that Replicel can’t turn vellus hairs into terminal hairs but it might be able to turn intermediate hairs into terminal hairs. Some people don’t get hair transplants because even the hairs in their donor area get thin and fine. I see people every day with thin wispy hairs in their donor area. If Replicel can arrest hair loss then it could prevent your donor hairs from getting thin and fine. It could also protect what hair you have in your thinning area so you wouldn’t need as much donor hair to be transplanted into your thinning area and that means your donor would go further. You aren’t thinking it through. @jarjarbinx I doubt that this will work as well as you think. If the follicles in some people’s donor areas are weak and thin, then removing DSC cells from those weak, thin follicles and using them to try to rejuvenate follicles in balding areas will not be a success. It’ll be “garbage in, garbage out.” Cells from weak follicles will not be of very much help to follicles with weak cells. In the intercytex study the diameter of hairs in the treatment area increased. I know that Intercytex and Replicel are different but they both involved cellular implants. Replicel is supposed to release some hard data very soon. Let’s reserve judgment until we find out if the diameter of hairs in the treated area increased and if we can be sure the hair loss stopped. One big question is what happened to the 6-month non-responders. The Intercytex success at increasing hair diameters was most likely seen only in patients who had a very healthy donor supply. But it sounds like you’re suggesting this as a supplement for HT where the donor area is substantially weakened by MPB. If so, I don’t think this will work very well. Think about it: if a person’s donor hairs are already miniaturizing (this happens in some people, making them bad candidates for HT), then how will pulling cells from those MPB compromised weak follicles in the donor area benefit the hair diameters in a recipient area? The cells are genetically compromised already. In these cases, those people are not going to benefit much by any kind of rejuvenative therapy. You’re just transferring bad cells around from one place on the scalp to another. On the other hand, everyone might benefit from an effort to create de novo follicles, like Dr. Tsuji is doing. 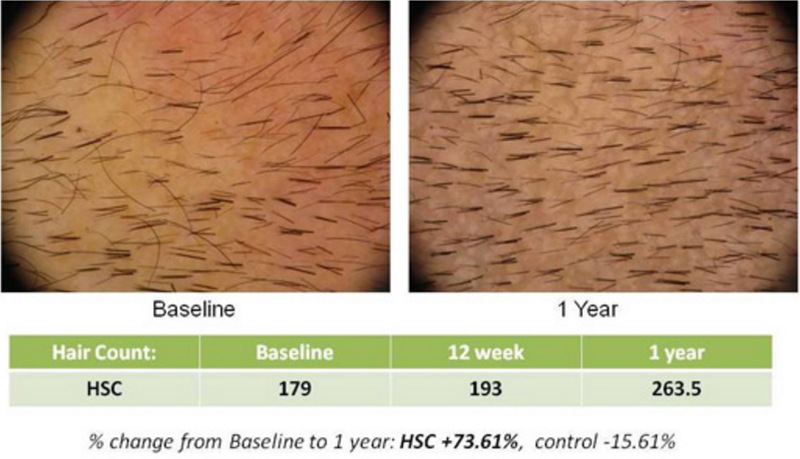 Donor area hairs get weaker over time but they last longer than hairs in recipient areas. And donor area hair cells can be cryo-preserved for future use so they won’t get any weaker than they are now. My donor area hairs are a LOT stronger than my recipient area hairs. Almost everybody’s is. And in a related issue, are the cells in miniaturized follicles actually weaker/smaller or is it the follicle that is weaker/smaller? Even in the case of vellus hairs, do the cells actually get weaker/smaller or rather is it the follicles that get weaker/smaller? The genetic characteristics of the cells is programmed in the DNA of the cell nucleus. That DNA determines the characteristics of the follicles, too. That is the whole reason Replicel and all the other companies have been using cells from the donor area. Because their better gene expression will result in healthier follicles that aren’t susceptible to MPB. My donor area follicles are much stronger and bigger than my recipient area ones, too. And yes, that’s true for most people with MPB hair loss. But if you’re suggesting Replicel as an answer to the SUBSET of people with particularly weak, feeble or thin donor hair (we’ve all seen people like this, especially very elderly people), then I think that isn’t going to be a great solution for them. These people are bad enough off that they have MPB. They’re even worse off than most because they’re losing their donor hair. Now you want to target the very people who have poor donor follicles and say this cell-based treatment (weak as it seems to be from their phase I results – which is extremely weak), is a good option for them? I think that’s a very roundabout answer to treat them. I think that’s based on too many weak links in the chain to do them any good. To me, something like that alone is not worth Replicel continuing its efforts, unless they’re sitting on some new secret that they haven’t yet disclosed. I’m not excited AT ALL about Replicel, from what I know now, period, for those people or for us. But let’s see what Drs. Kemp, Tsuji, and Terskykh can come up with. There’s no guarantee that any hair you get from Tsuji or Kemp or Terskykh or Follica would be immune to the ravages of DHT so it’s best to also have a separate treatment in the marketplace that will protect any hair you recover from other treatments. Plus, if Replicel can truly freeze hair loss in its’ tracks there is no doubt in my mind that it would DRAMATICALLY increase the number of people who could recover a full head of hair via hair transplantation, especially if you factor in cryo-preserving hair cells so they retain their present level of quality. No, but if you have good donor cell genetics, and the cells come from those lines, it should last as long as your donor area hair does. Again, as you pointed out, for some that will be a very long time, and for others, not so long. The point is, it won’t be any WORSE. Ha, good luck getting answers to these questions. First, correct me if I a wrong but I think Lee Buckley has only been with Replicel for about a year , I doubt he has any indepth knowledge about a trial that was done 5 years ago way before his time. Second, as others have pointed out, why are we placing any faith in a trial that only had 19 participants? Hey xbox, are you saying we should completely ignore the study because there were only 19 subjects? Aren’t Initial small studies part of the process? Of course, one should keep in mind that it’s a small study, and that results could be much different in a larger study. But one should still evaluate the information from small studies. And when one evaluates that information (from small studies) one should still look for faults and red-flags and try to resolve them. And that’s what I’m trying to do. Thanks though for being thorough in telling me that it’s best to ignore potential breakthroughs if they start with small studies. Since all treatments start with small studies I guess that means we should ignore ALL potential breakthroughs. That’s what we need more of - ignoring potential breakthroughs. But this is one reason why you don’t like the idea of getting hair transplants to get more coverage and using Replicel to protect it. And now you agree that the same problem would potentially exist with Follica, Tsuji, Kemp, and Terskykh. No matter which of these treatments is used, for people with some thinning in their donor area the best solution is to cryo-preserve cells. They’ll have to thaw some and inject them more frequently than people who have better donor areas but at least they’ll have a solution. For the same reasons that cryo-preserved cells might protect from future losses if you get Follica, Tsuji, Kemp, or Terskykh treatments; cryo-preserved cells could also protect from future losses if you get a hair transplant coupled with Replicel. Yea, the cryo-preserved donor area cells of people with somewhat thinning donor areas wont be as good as the cells of a 16-year old’s donor area, but the same can be said of those same cells when they’re used to create hair germs (or whatever) for Follica, Kemp, Terskykh, or Tsuji treatments. No, I am saying an intelligent person can decide based on the facts that Replicel ain’t what we want. There aren’t enough facts yet (for an intelligent person) to make a final judgment about Replicel. And first you say the study is too small to put any faith in it and now you say that the study is sufficient to decide that Replicel isn’t what YOU want. Are you PMSing? Listen Einstein, I am willing to change my opinion if they are able to provide more data but right now based on the before and after photo and the 2 yr data, both btw very disappointing, it is not something that I am excited about and I certainly will not put any faith in this. How come you guys are not more excited about Histogen? Histogen is the clear winner here according to this topic, shouldn’t we be after Histogen?